I teach third grade. They're a lot of fun. 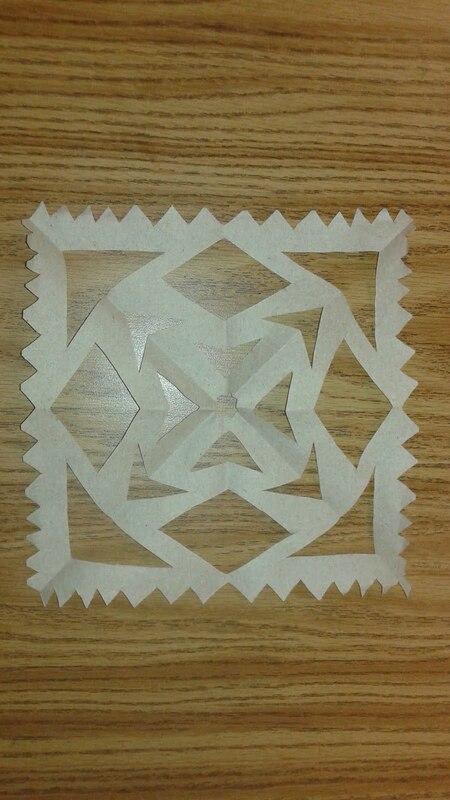 One of them cut me a snowflake from a paper towel from school. I'm not sure why they were using towels instead of paper, but the design is fabulous! 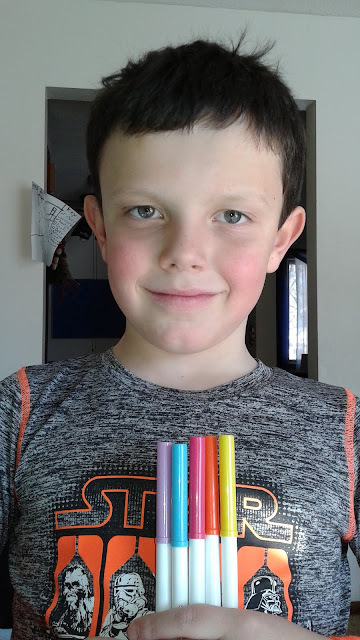 My son also came up to me the other day with this set of markers claiming, "Mom, these would make good colors for a quilt." Yes, kiddo, they would! MN and WI Friends - I'm Speaking and Teaching Near YOU in February! 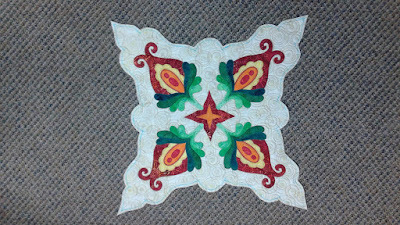 I am excited to be speaking about my competition and bloggy quilts for Minnesota Quilter's February meetings. 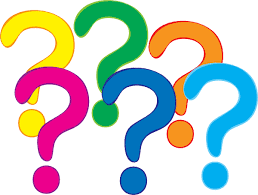 The meetings are on Thursday, February 2 at 7 pm and Saturday, February 4 at 10 am. The meetings are at their Fabulous new location. Directions can be found here. I'd love to see you there! Here's a few quilts I'll be showing. 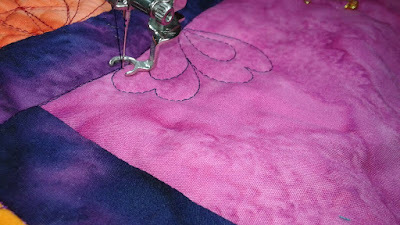 I'm also teaching Free Motion Quilting on Sunday, February 19th at Forever Gifts Boutique (a wonderful quilt store!) in Prescott, Wisconsin from 1-4 pm. You can check out their website here. 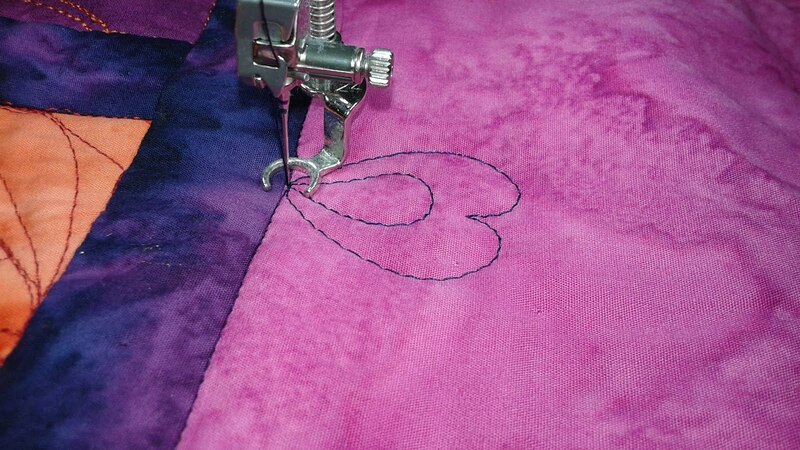 With Valentine's Day coming up I thought it would be fun to create some heart designs. 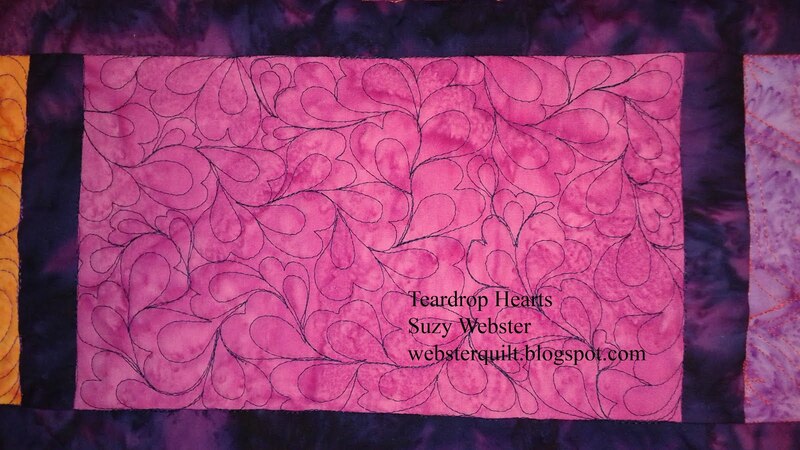 This first one is called Teardrop Hearts. You can find the written directions here. To start you make a tear drop. Then quilt a heart around it. Then create a second heart to one side of the first. If you can't start from where you finish the first heart then travel to where you want to start the next. Here are the first 8 or so hearts. You can see that right in the middle there is a smaller heart due to space limitations. Oh well, it won't be really evident in the final design. And here's the final design. 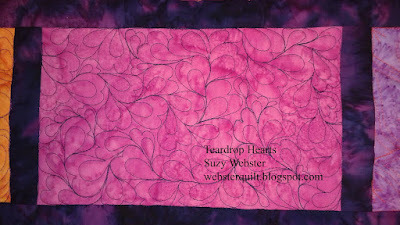 Wouldn't Teardrop Hearts make a great filler on a heart-filled quilt? Or one for your loved ones? I hope you get to quilt today! I do....going on retreat! 2. 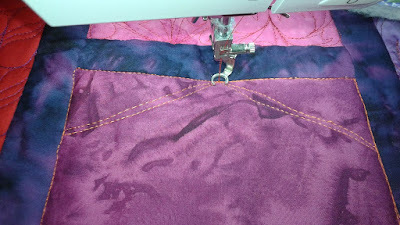 I cut into the interior points while I was putting on the binding. Would it turn out better if I didn't do this? Food for thought for next time. You can see that the interior point doesn't lay well. 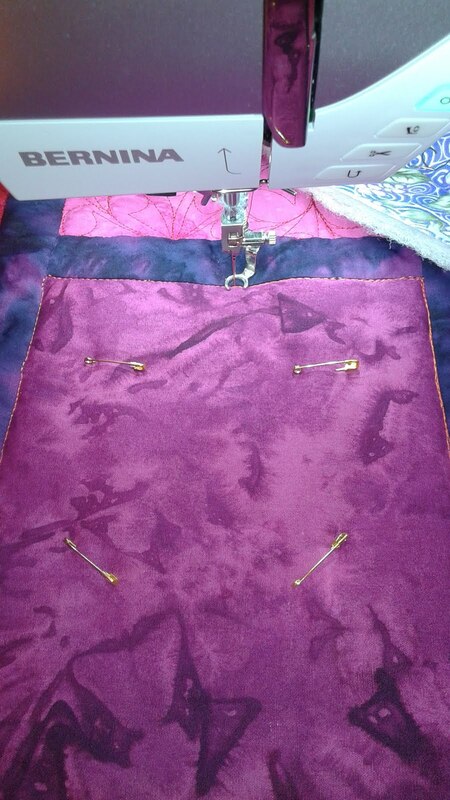 I tried to pull it in and stitch it down in a miter, but there wasn't enough fabric to make it work well. 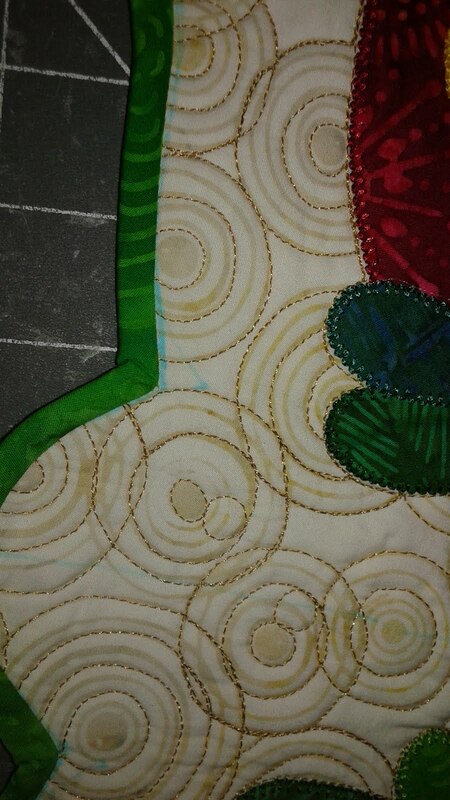 Since I didn't want to block and flatten the quilt when I was done I used an Eraser Pen to get rid of all the blue marks. It worked great! 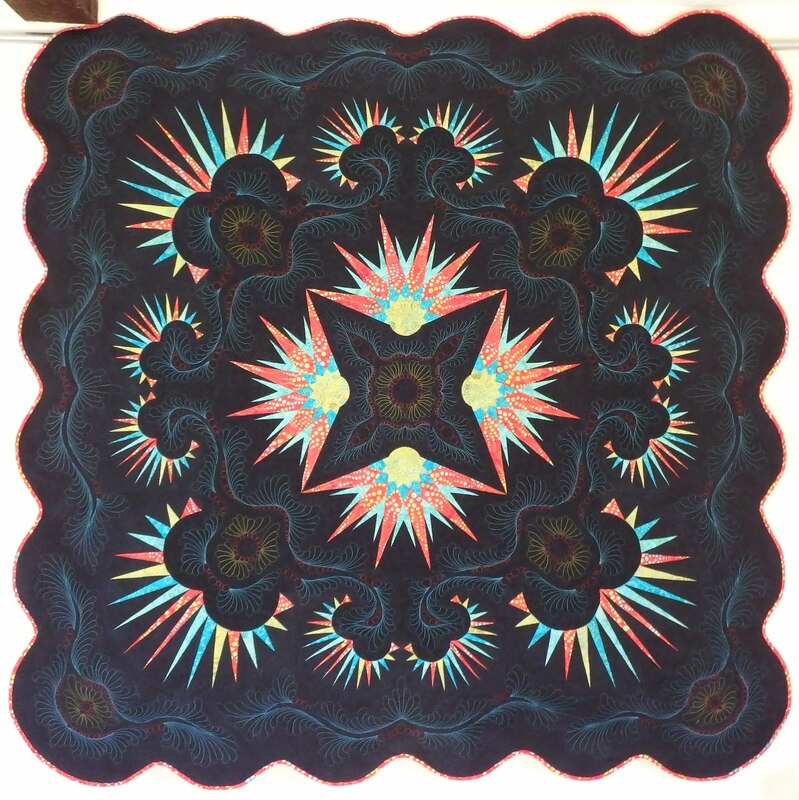 The final table topper. I love it even though it's not perfect! 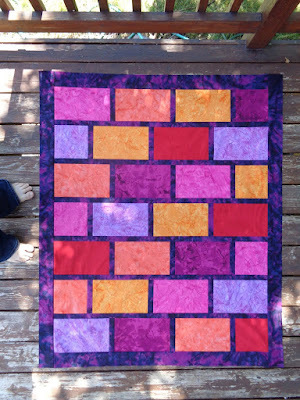 One thing I have definitely learned in doing my blog is that not everything I quilt has to be perfect. That's okay and it's even more fun that way! I love my mother to pieces. 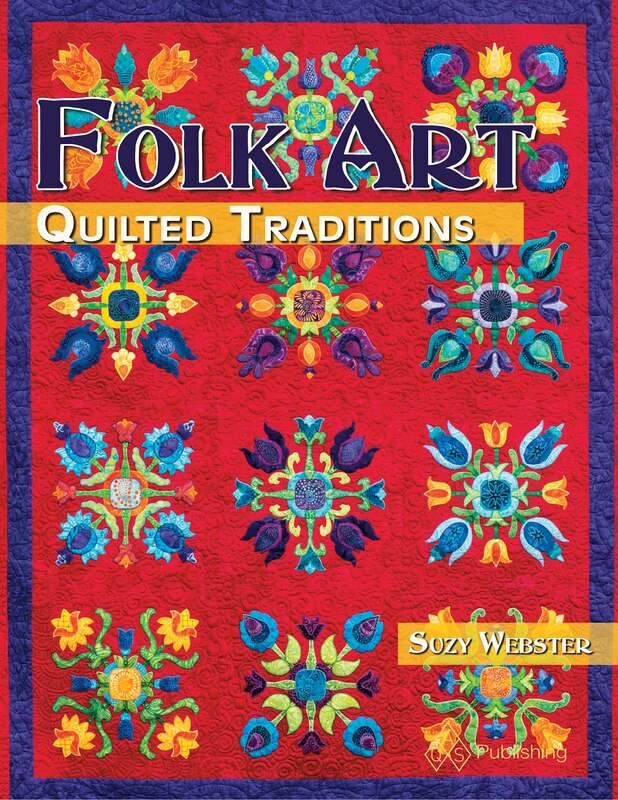 She taught me to quilt and has always been supportive of everything I do including making quilts for my book! 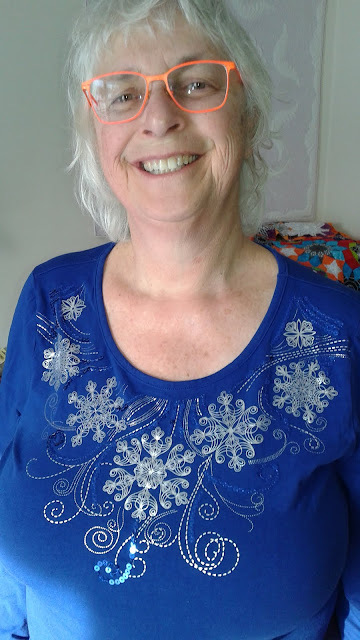 The other day she came over wearing this shirt. 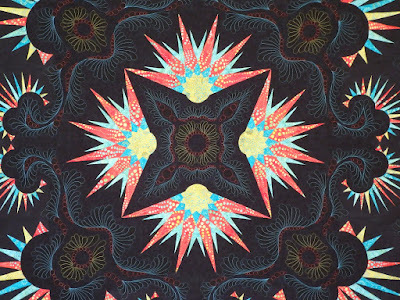 I love the snowflake patterns and the trails of dots would make fabulous quilting. Plus aren't her orange glasses fabulous? I happened to notice my tally of blog posts the other day and this very post is number 300! How did that happen so fast? I never knew when I started blogging that I would enjoy it so much! It's a blast sharing what I'm learning and creating. 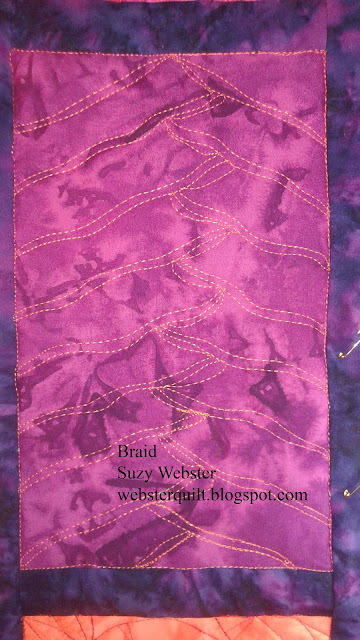 It gives me some creative freedom and permission to make something that is not a show quilt. I love those too, but blogging has been very freeing from that. So...what to do for post 300? How about a few highlights! 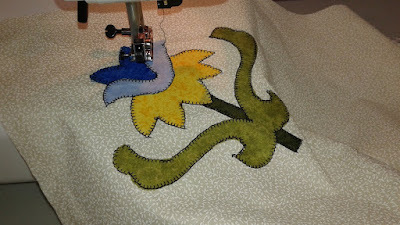 First of all, I started not only this blog, but at blog post 100 I started a Facebook Group called Machine Applique Adventures which is up to about 550 members! There are people form all over the world in the group which I find so amazing and fun. Second, becoming an Island Batik Ambassador has been an absolute pleasure and thrill! 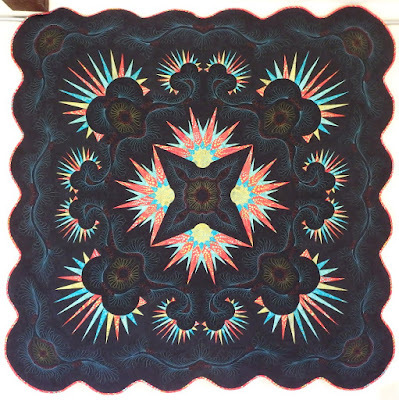 Here are a few lovely projects from my 2016 tenure. 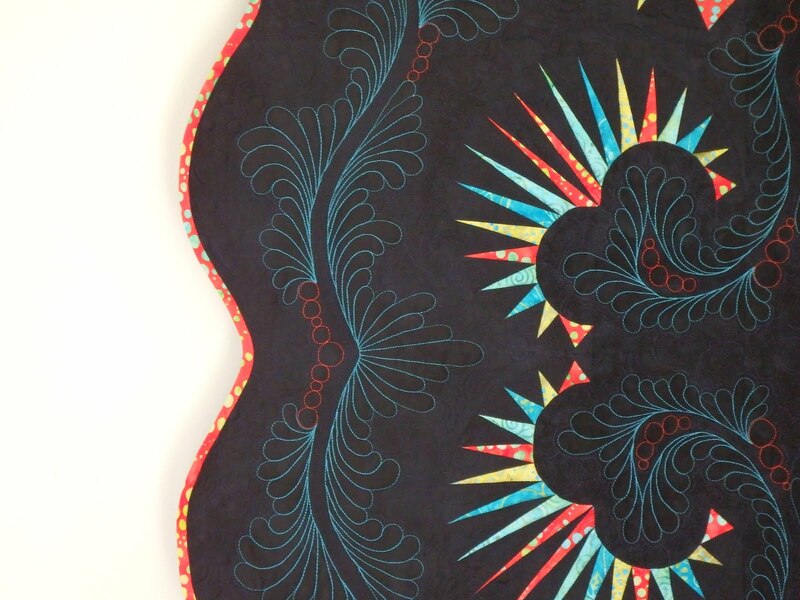 FIRST, my current show quilt Kaboom! took third place at Road to California. So exciting! 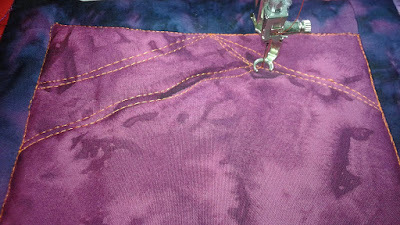 I used a dark navy thread for the fill work so I could see what I was doing. I like the subtle effect it makes. These photos are from the back of the quilt. 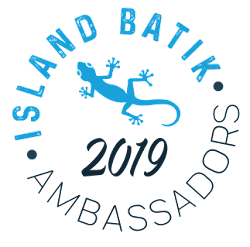 SECOND, I have been accepted as an Island Batik Ambassador for 2017! 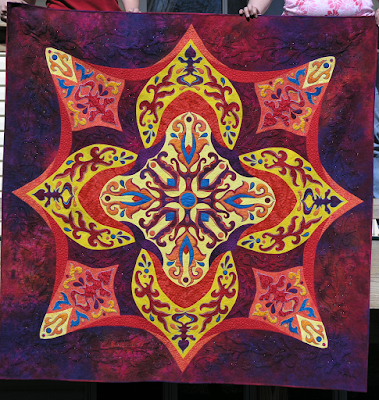 That means more luscious batiks and more quilting fun! Stay tuned! 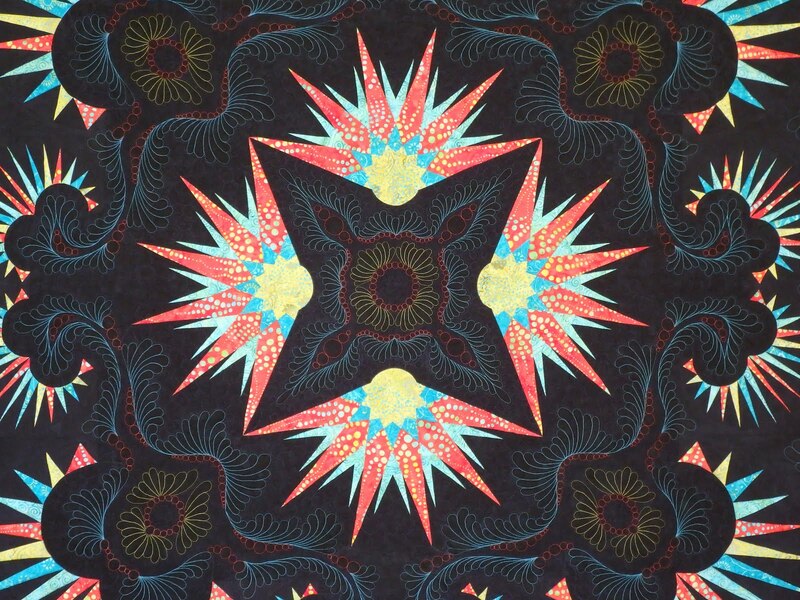 Labels: #islandbatik, Island Batik, Island Batik Ambassador, Kaboom! 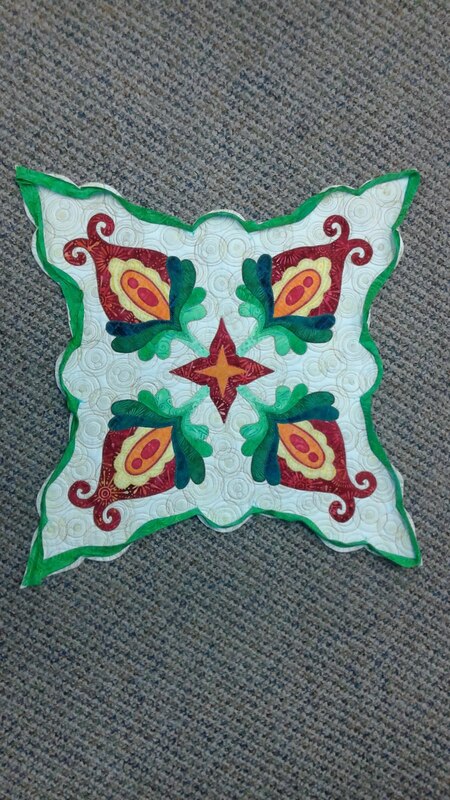 My First Time Teaching from Folk Art Quilted Traditions! 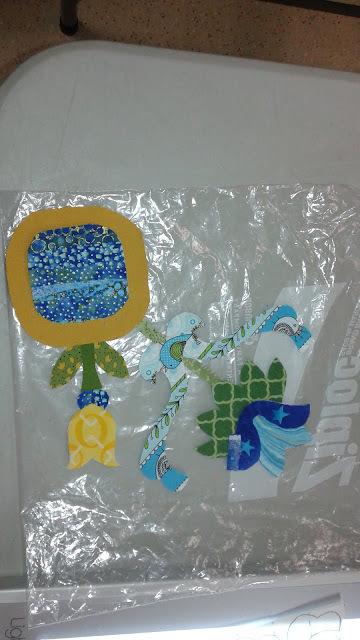 I had the amazing opportunity to teach for my state quilt guild on Monday! 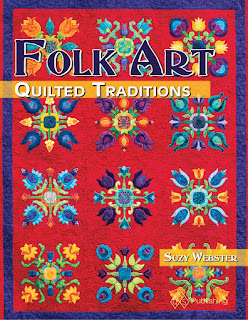 It was the first time I've taught from my new book Folk Art Quilted Traditions that came out last August. 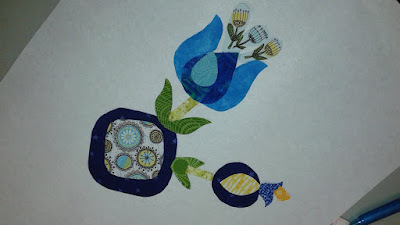 I had 13 amazing students and we had a blast picking blocks and fabrics. 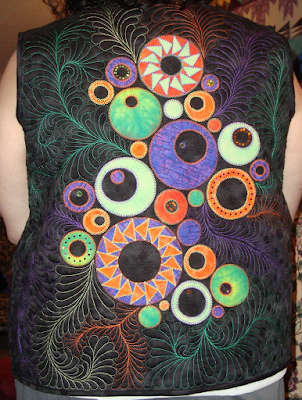 They kindly gave me permission to post some photos of their work here. 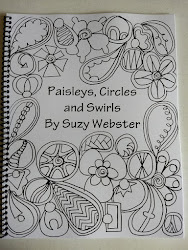 If you'd like to order a signed copy direct from me I can now do Paypal invoices. 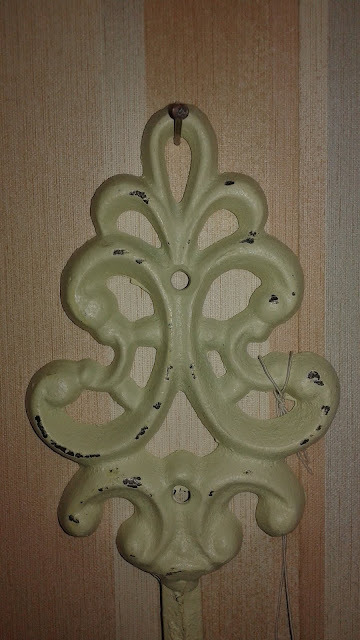 Just used the contact me link at the top of my blog and I will be happy to send a copy your way! Books are $20 plus $5 shipping. Playing with solids and one print. 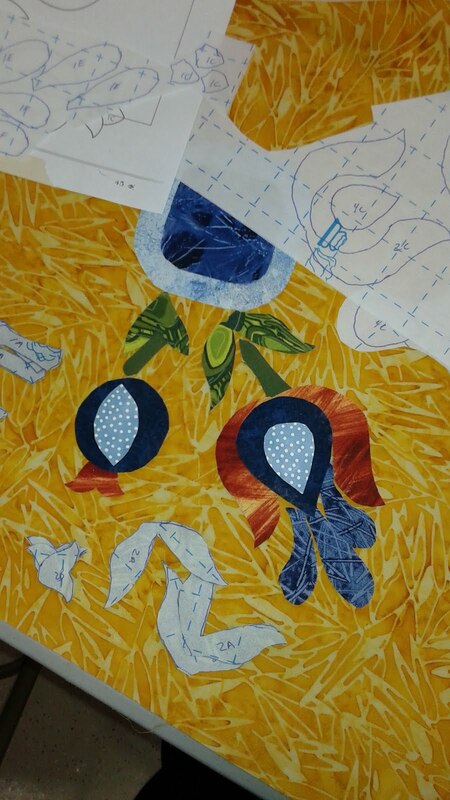 The use of the stripe with the birds in it is so much fun! I love the playful prints in this block. 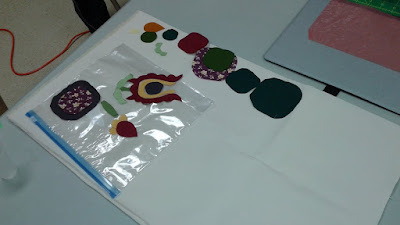 This student did an embroidery design to put in the middle! How fun! 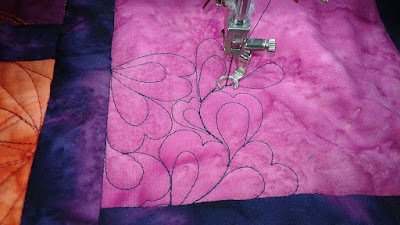 Starting to stitch with black thread. It's so much fun to share my passion with others! Here are a few pictures I've taken recently of decor in various businesses and restaurants. 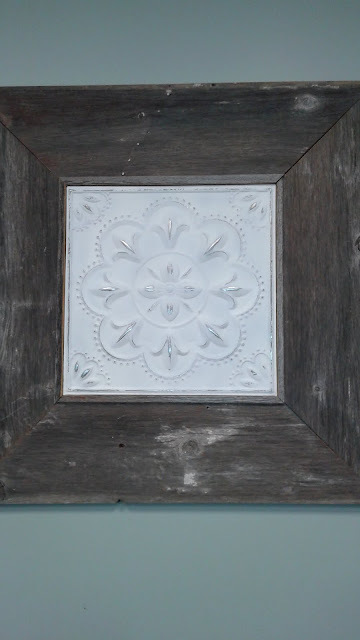 I love geometric objects. A year or so ago I started making this quilt top. 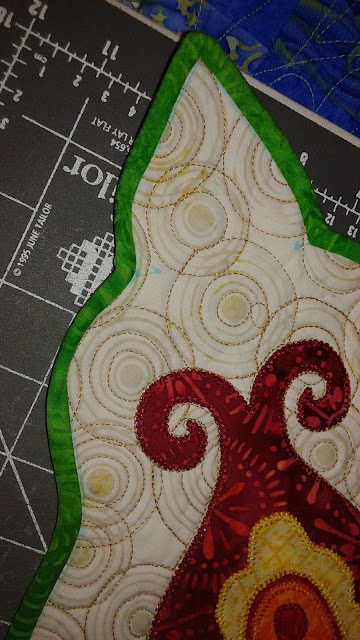 If you look closely you can see that only part of it is quilted and there's a blue outline as to the final shape I wanted it to be. 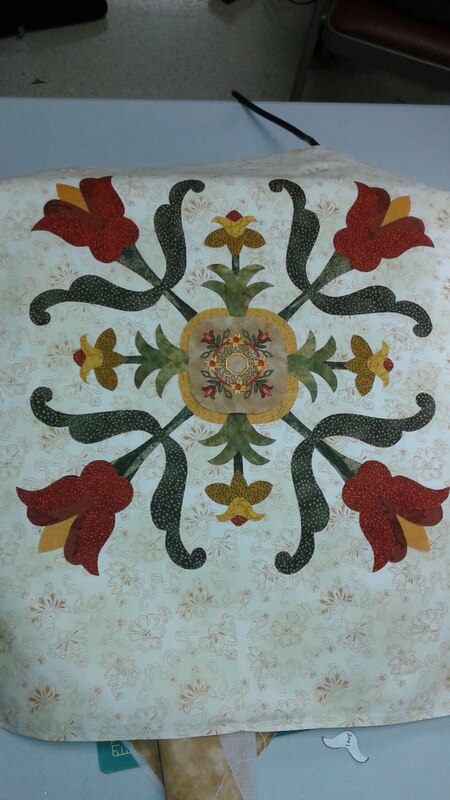 This quilt was sample for me about doing curvy bindings. I've done large, loose curves before without any issue. However, I'd never done something smaller. This quilt is about 16 inches across. 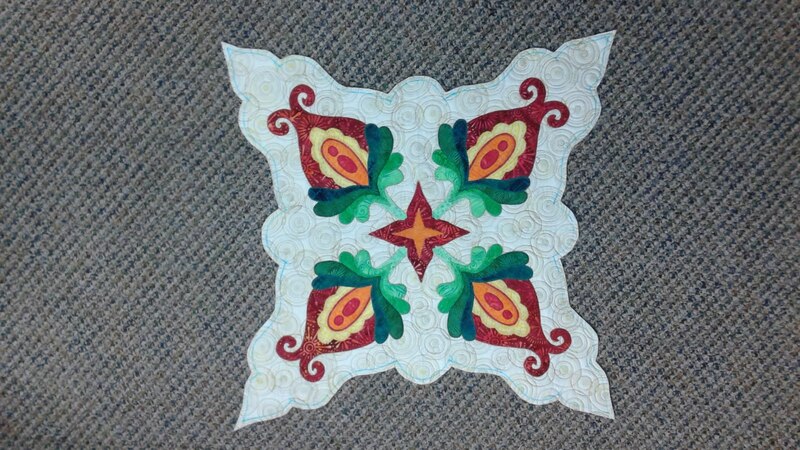 After the quilting was complete I cut out he final shape of the quilt. I love it, but it was daunting to think about putting a strip of binding around those curves. Here's the top with the binding all sewn on. I cut into the points so I could "straighten" the edge when I was sewing the binding in those sections. Come back Wednesday to see the finished product. 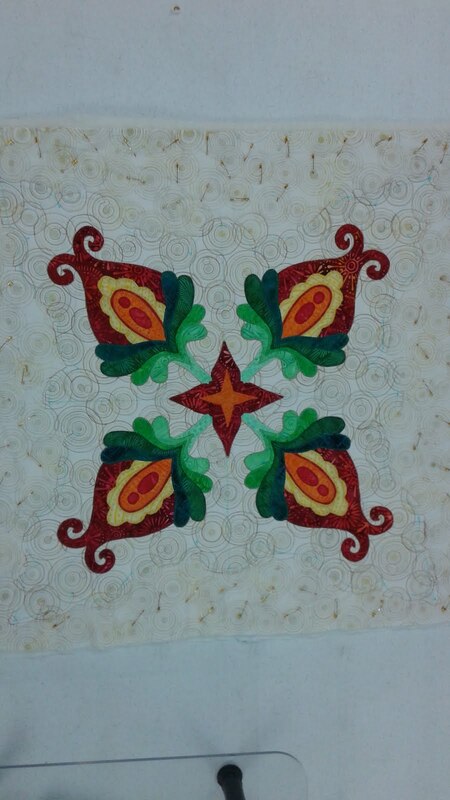 This week I wanted to do a simple design that could fit well in sashings and small borders. 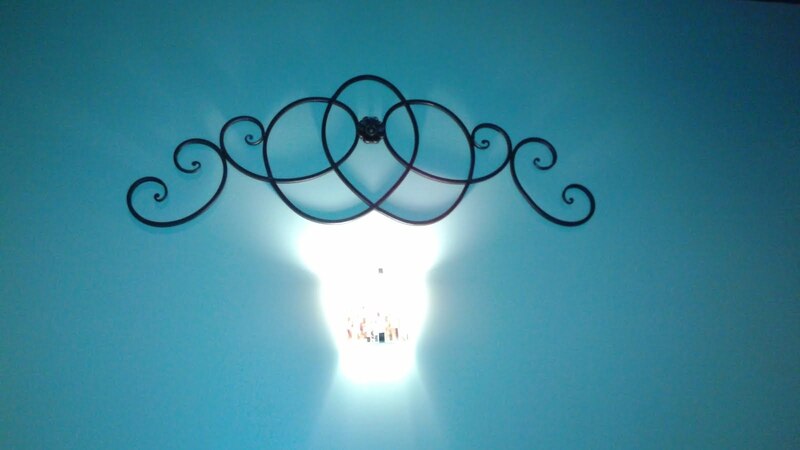 This design is a Braid. 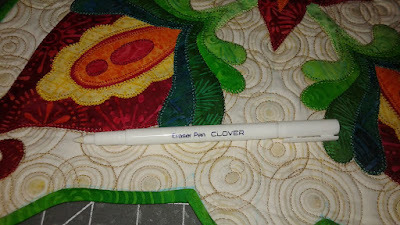 You can find the written directions here. Start at the middle of the skinny end of your rectangle. Stitch to the right edge, then stitch back to the center. 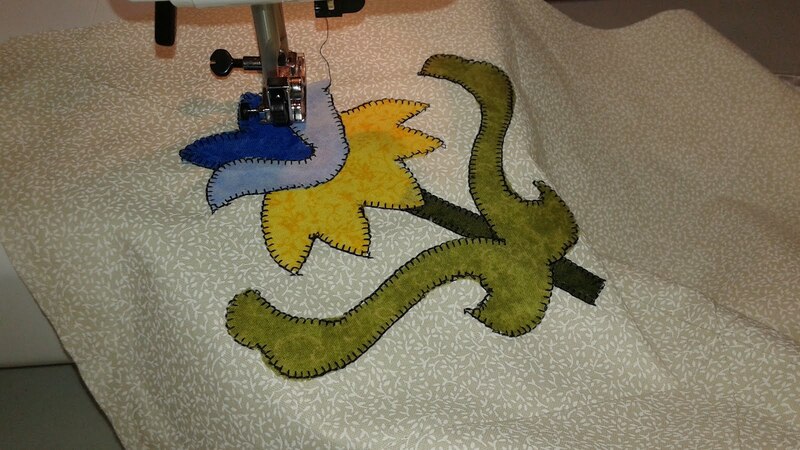 Then stitch to the left side and back to the center. 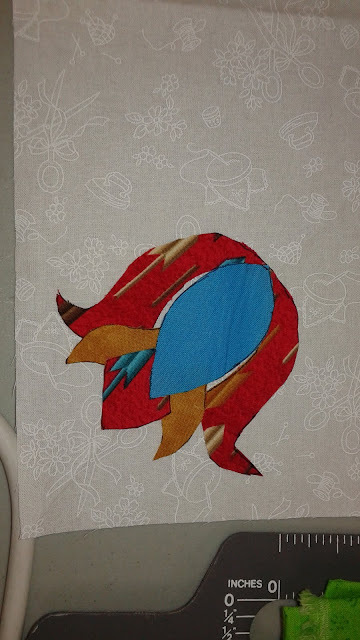 Stitch down about 1 inch on the right. Then stitch to the left edge and back. 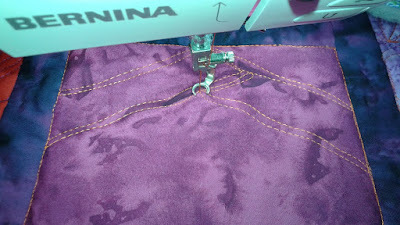 Stitch down about 1 in to the left and then stitch to the right edge and back again. Repeat this process. 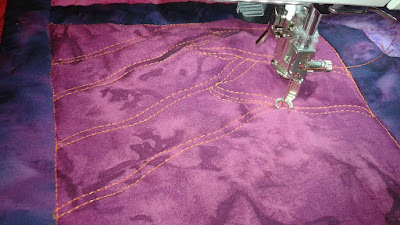 Adding another layer to the stitching. 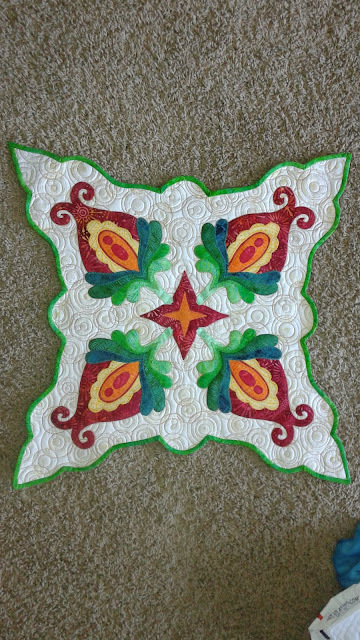 If you wanted to really go all out you could quilt a different design in each section....but it might be a little much?